My pastor has challenged our church members to read through the Bible in a year. I'm not quite ready to make that commitment, but I did find this resource on BibleGateway: A chronological reading plan that tells the essence of what the Bible is about and that can be read (and listened to at the same time!) in 61 days. If I get through this, I'll take the next step! For everyone out there with iPhones, here are some super tricks from ismashphone for the iPhone. I tried the ringtone maker and it works great! You might also be interested in iPhone Fully Loaded for more ways to use your iPhone! RBC Ministries offers free Bible studies, devotion booklets, and Christian courses. I use Our Daily Bread everyday. I like it better than other devotionals because of the amount of scripture in each lesson. Rather than one verse and the rest commentary, it includes one page of a portion of scripture and one page of commentary. Sometimes I don't even read the commentary. It's like reading the Bible in chunks! I've also used one of their Christian courses and love it! As of February 2009, you will be able to take the Christian courses for certification for a fee of $20/CEU unit. I would use this as a high school credit in Bible also. Highly recommended. The materials are written by Christians of many denominations. You can read their biblical principles here. If you use their materials, PLEASE, send them a donation now and then. God would want you to! 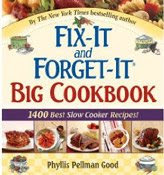 This came from the book, Fix-It And Forget-It Big Cookbook: 1400 Best Slow Cooker Recipes and it's yummy!!! 1 garlic clove (minced) in 1 Tbs. oil. Stir. Cover and cook on low for 8 - 10 hours. This recipe was in the booklet that came with the cooker. My daughter works at an upscale restaurant and has very expensive food tastes. She loved it! Brown meat on all sides in 2 Tbs. oil, then place into crock pot. Stir. Cover and cook on low for 8 hours or high for 4 hours. Set on high, cover and cook for 20 more minutes. Serve with fried Chinese noodles. I've been through three crock pots with no luck. They either burn the food or produce mush. I just gave them away and decided crock pots weren't for me. However, this semester my classes are during the dinner hour, so I needed to figure out a way to have a meal waiting. All my friends said, "Crock pot." 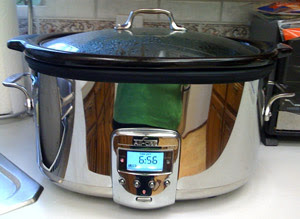 So, I began a new search and finally found the cadillac of crock pots - an All-Clad Stainless Steel Slow Cooker . It's wonderful! See my full review on the product page. I'll put up a couple of my recipes next. As a Vine Reviewer for Amazon, I get to review books as they come out. This week, I read the book, "The Motley Fool Million Dollar Portfolio: How to Build and Grow a Panic-Proof Investment Portfolio ." I sent my review to Amazon today. This is not a subject I am an expert on, but reading books like this helps me learn more. Despite the economy, there is a reason to invest, especially if you are young! And this book helped me see some areas I might work on to improve my shrinking portfolio - maybe it will get bigger instead of smaller like it has been! I highly recommend checking out this book. It was easy to read and had lots of information for newer investors. While you're there, please comment on my review. Let me know if it was helpful. I love working on my computer, writing, and surfing the Internet. It's even more fun if you can make some money from your efforts! For Christmas, I received two books: ProBlogger: Secrets for Blogging Your Way to a Six-Figure Income by Darren Rowse and Moonlighting on the Internet by Dan Kennedy. Both are excellent! Each one attacks it from a different direction but generally cover how to decide on a niche, strategies for making money, and how to promote your blog. Moonlighting also covers making money from eBay, eCommerce stores, and affiliate links. If you're looking for a way to make a little money while on the Internet, I highly recommend these two books.